As a nation we are committed to creating environments where children grow up loved, safe and respected, and the Scottish Government is now committed to incorporating the principles of the United Nations Convention on the Rights of the Child (UNCRC) into Scots law. With these factors in mind it is imperative that children’s views are sought in all matters that affect them, particularly in relation to their awareness, understanding and experience of their human rights. In this consultation, we worked with 157 children between 6 and 11 years old from five areas across Scotland – Aberdeen, Argyll & Bute, Edinburgh, Glasgow, and Perth & Kinross. In addition to representing a wide range of geographic communities, including rural and remote areas, children from specific groups were also involved in our body of work, including children with care experience, refugee and migrant children, and children with disabilities and additional support needs. This consultation also builds on previous Children’s Parliament work. With this in mind, for this report we revisit earlier reports with relevant themes, including: Children as Human Rights Defenders (a 2018 project leaflet about the role children have as human rights defenders), Happy, Healthy and Safe in Care (a 2018 project report with key messages from children with care experience), Children’s Parliament Investigates Bullying (a 2016/7 project investigating bullying from a children’s rights perspective), All children should be healthy, happy and safe (a 2016 consultation with children with disabilities about their rights), Together We Can Fix It (a 2015 consultation on raising complaints), and How Does Your Garden Grow? (a 2014 consultation report on the Children and Young People Bill). 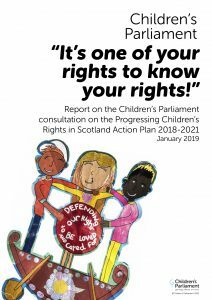 Click here to access or download the Children’s Parliament Children’s Rights in Scotland 2018 report.